Sleek design, meticulous finish, tempered steel middle…together they have established the exclusive character of the Worldcode watch, launched in 2010 for the brand’s 125th anniversary. 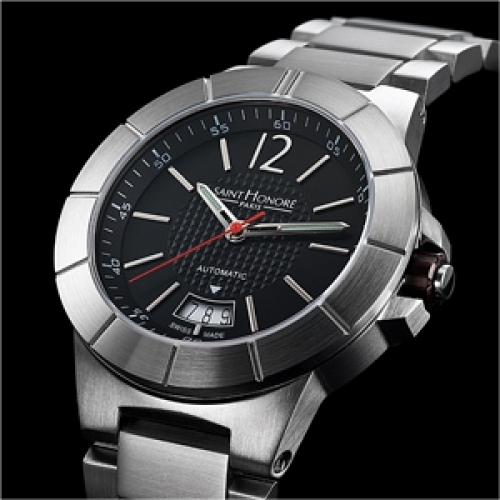 The Worldcode is the most masculine symbol of the SAINT HONORE range and a watch of exquisitely harmonious design. The new Automatic version has the added prestige of a mechanical movement with exceptional fundamental qualities. With subtly contrasting tones and polished and brushed steel finishes, the Worldcode Automatic recaptures the watchmaking codes of the Chronograph model with power and virility: 41 mm round case; steel bezel finished in shades of brushed steel, titanium, pink or yellow gold; black or white dials, clous de Paris motif or “carbon” dials for a sportier touch; superbly streamlined metal bracelet. The Automatic version’s unique bezel has cleaner, more modern lines. The Roman numerals found on the Chronograph version give way to a bezel marked only with 12 indexes, with a double at 12 o’clock. Following in the footsteps of the well-loved Chronograph, the new Worldcode Automatic reveals its sophistication and technical prowess through a transparent, screw-down case back which lets an automatic ETA 2824 movement, signed SAINT HONORE, show through beautifully: côtes de Genève décor, oscillating weight gilded in black gold. It is clear that a watch so rife with character will hold strong appeal for men who love sleek elegance and the most striking possessions. Automatic, ETA 2824 movement, Côte de Genève motif, black gold plated oscillating weight.